Looking for a delicious healthy appetizer? 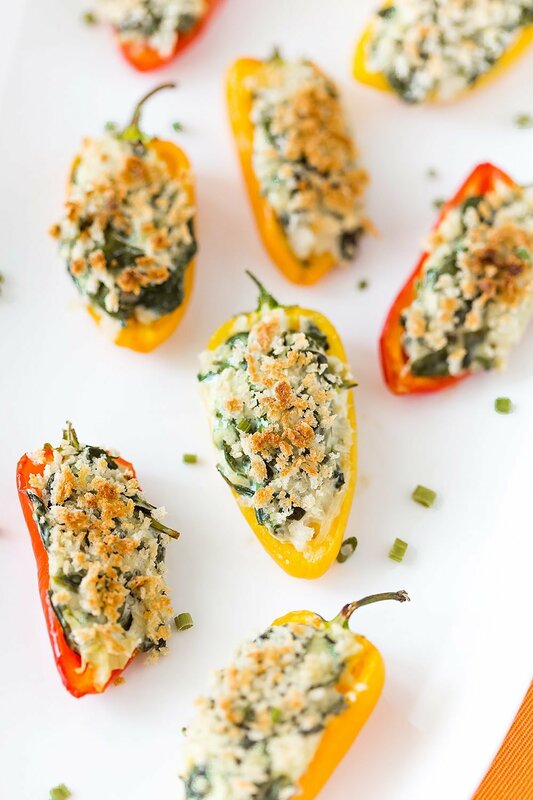 You’ll love these spinach and artichoke stuffed mini peppers! Time for one of my very favorite healthy appetizers, Spinach and Artichoke Stuffed Mini Peppers! I could eat these for a meal (and I have) because they’re absolutely addictive. 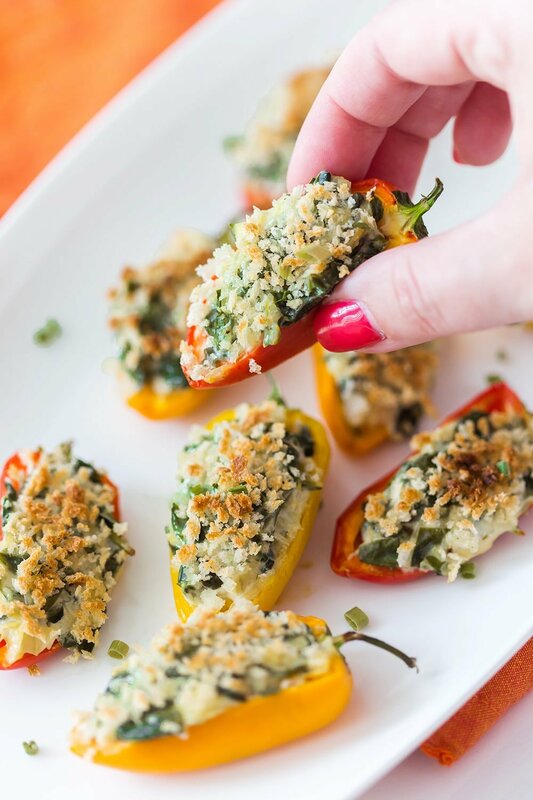 Each mini pepper is stuffed with a spinach and artichoke filling and topped off with a sprinkling of seasoned panko crumbs for the perfect crunch! Perfect for a party, y’all! As you can see above, these stuffed mini peppers are the perfect bite size appetizer! You can prep a lot in advance and bake right before you entertain guests. They will LOVE this appetizer. The filling is my favorite. Sometimes, I even make a double batch of the spinach artichoke filling to use as a dip. It’s made with nonfat greek yogurt so it’s low in calories but doesn’t skimp on flavor! My grocery store has these cute mini peppers in a bag of about two dozen. So check your market’s produce section to see if yours also sell them this way. It’s easy to grab and have ready. I often have them on hand to whip up appetizers for last-minute guests. You can fill them with just about anything, but this spinach artichoke version is my fave. Another thing I love about these stuffed mini peppers is how colorful they are! They look vibrant and delicious on a platter at a party. It’s always an appetizer I’m excited to serve! 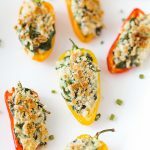 If you love stuffed peppers, you HAVE to try these from my brother, so delish: Goat Cheese and Chive Stuffed Piquante Peppers! An easy and healthy appetizer, these stuffed mini peppers are a crowd-pleasing go-to! Preheat oven to 315 degrees F. Slice mini peppers in half lengthwise. In a mixing bowl, combine spinach, chopped artichokes, greek yogurt, cream cheese, parmesan cheese, garlic, Italian seasoning, salt and pepper. Stir to combine. 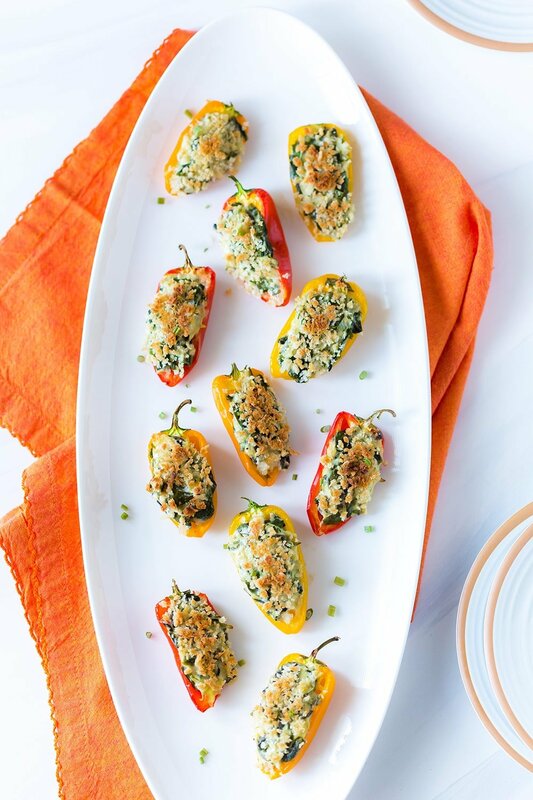 Fill each mini pepper with spinach artichoke filling. Top each with seasoned panko crumbs. Bake for 15-20 minutes or until crumbs start to turn golden. To brown the crumbs further, broil for 1-2 minutes, watching carefully to avoid burning. Perfect appetizer for a party! Pinning for later!